Posted by Rob Young in Ambient Music, Biography, Flux Music Essentials, Jazz, Music, New Music, Press Release, Videos, Vocals, What's New? Posted by Rob Young in Be-Bop, Biography, Creative Music, Improvised Music, Jazz, Mainstream-Traditional Jazz, Music, New Music, What's New? CTI Records 40th Anniversary Celebration Continues! Posted by Rob Young in Contemporary Jazz, Flux Music Essentials, Grammy Award Winner, Grammy Nominated Artists, Jazz Re-issues, Mainstream-Traditional Jazz, Music, Music News, What's New? Long overdue, I can’t wait to revisit these marvelous recordings from CTI! Also available, critically acclaimed CTI Records: The Cool Revolution deluxe 4-CD box and California Concert: The Hollywood Palladium 2-CD set featuring previously unreleased tracks. NEW YORK, Jan. 20, 2011 /PRNewswire/ — Masterworks Jazz continues the celebration of the 40th anniversary of CTI Records, the beloved jazz label founded in 1970 by producer Creed Taylor with the release of 6 more classic reissues available on January 25th, 2011. They include: White Rabbit by George Benson, All Blues by Ron Carter (first time on CD in the U.S.), Prelude by Deodato, Pure Desmond by Paul Desmond, Concierto by Jim Hall, and Milt Jackson’s Sunflower. The reissues are packaged in eco-friendly softpack sleeves that replicate the original gatefold LP design and their iconic covers most with photos by Pete Turner. Posted by Rob Young in Contemporary Jazz, Flux Music Essentials, What's New? With CTI Records having gone independent in 1970, founder Creed Taylor celebrated the early success of the label with a one night only concert at the Hollywood Palladium on July 18, 1971. Taylor handpicked a dream team of CTI artists for California Concert: The Hollywood Palladium, with GEORGE BENSON on guitar, FREDDIE HUBBARD on trumpet, HUBERT LAWS on flute, STANLEY TURRENTINE on tenor saxophone, HANK CRAWFORD on alto saxophone, JOHNNY HAMMOND on organ and electric piano, RON CARTER on bass, BILLY COBHAM on drums and AIRTO MOREIRA on percussion. California Concert: The Hollywood Palladium is newly remastered from the original two-track analog tapes and is the most complete version of the legendary concert ever released. This 2-CD set doubles the content of the original five-song LP release with five additional tracks – three of them previously unreleased – and restores the original concert sequence for the first time. Ron Carter, consummate musician and gentleman shares his remarkable journey into the pantheon of jazz greats in the just released Ron Carter: Finding the Right Notes, penned by veteran jazz journalist Dan Ouellette. Much like the bassist’s own propensity for moving the genre forward, this project takes the very tradition of biography forward with its multi-platform approach to storytelling. Though the book can be purchased online, the experience doesn’t end with the written word. Publisher ArtistShare incorporates new media elements such as podcasts, streaming video and audio clips, as well as exclusive photo galleries on the project websites. Visit, RonCarterBass.com for information about this legendary bassist. ..:: Source: Pendulumswing.wordpress.com, also artistShare.com ::..
Ron Carter is regarded as one of the greatest jazz bass players of all time. This album, Etudes, was originally issued 1983 on the Elektra/Musician label. 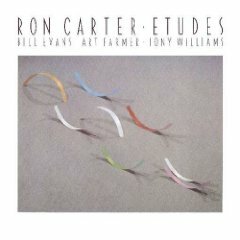 Etudes features pianist Bill Evans, drummer Tony Williams & trumpeter Art Farmer.